I’m March’s featured artist at Winslow Art Center Gallery in the heart of Winslow which is just a short walk from the ferry, in time to anticipate spring’s blooming season. 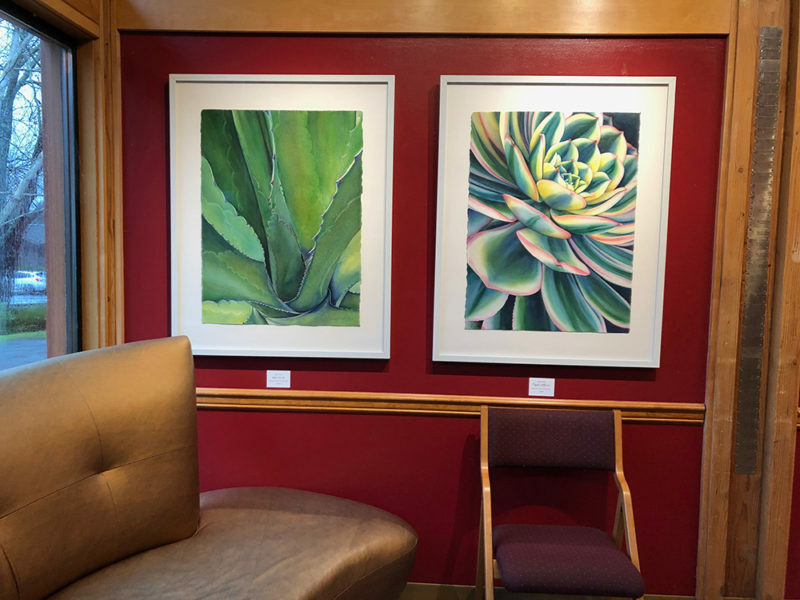 Come to Bainbridge Island for its lively Art Walk on Friday March 1 for the reception of my Floralscapes show including my large triptych and several other new succulent paintings. Check out the great space where art workshops, classes and open studio space is offered alongside its gallery. My art will be exhibited there until March 29 if you can’t make it to the Art Walk. Reception: March 1, 2019 6pm – 8pm. Join me! I’m offering an 8 week class, Watercolor Painting from Photo Reference, in conjunction with this show, teaching my watercolor process to beginning and continuing painters at this location. See some former student work here. Aren’t they amazing? Most are first time watercolor painters working on a subject of their own choosing. I’m looking forward to being inspired by students again. Join me this Friday at the reception and I’ll immerse you in the colors of NW spring and the warmth of the SW desert. Princess Lace. 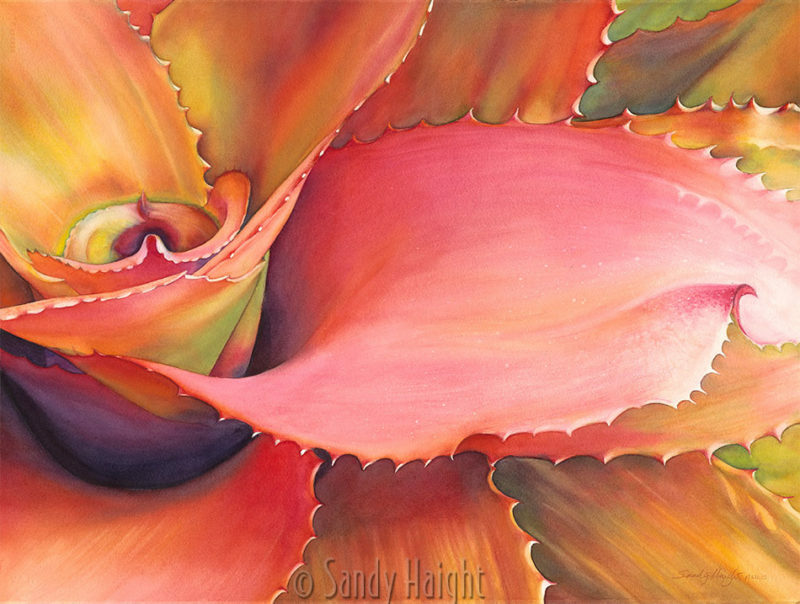 Watercolor by Sandy Haight. Image size: 30 x 22″. Frame size: 39 x 31″. Bainbridge Performing Arts Gallery has generously offered me the month of January to show my art in their theater lobby. This is my first local solo show since moving to Bainbridge Island from Seattle almost a year and a half ago. 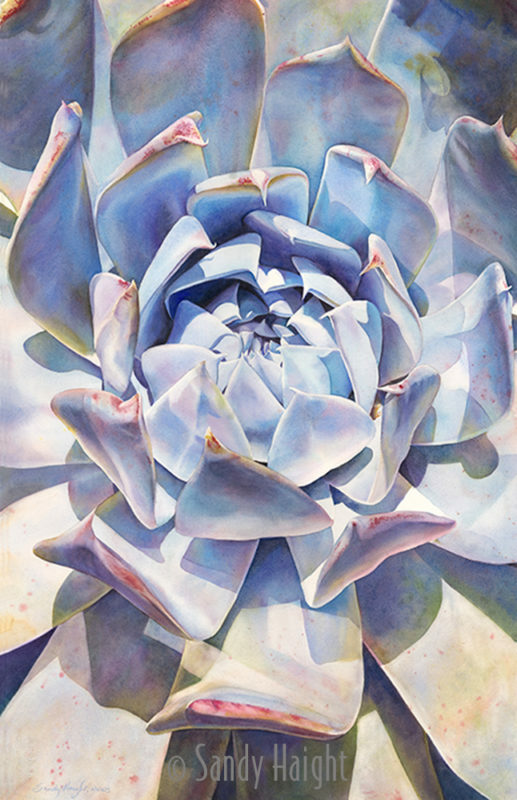 Come and see 17 of my big new succulent paintings and other Floralscapes filling the space. Princess Lace, above, is my promo image for this show! Reception! I’ll be at the First Friday Art Walk January 4, 2019 from 5:00-7:00pm. 200 Madison Avenue North, Bainbridge Island, WA 98110. Walking distance from the ferry! Here are some scenes of the installation I just completed with Gary’s help…a big job. Sedona Agaves #1 and #2. Frame sizes 30″ x 44″. Agave Verde & Ripples of Bloom. Frame sizes 31″ x 39″. Orchidaceous, Beguiling Kauai & LuminEssence. Frame sizes about 26″ x 21″. Teaching: This spring I’ll once again be offering my 8 week watercolor class after leaving Bellevue College where I taught for 10 years.. It will take place at the Winslow Art Center, linked here, within walking distance from the Seattle ferry. Bainbridge Island has a vibrant artist community and I look forward to being more involved this year. Winslow Art Center brings acclaimed artists from all over for workshops and inspiration. Stay tuned! Onward into 2019 with eyes wide open to beauty, art and community! Cheers! Morning Beauty. 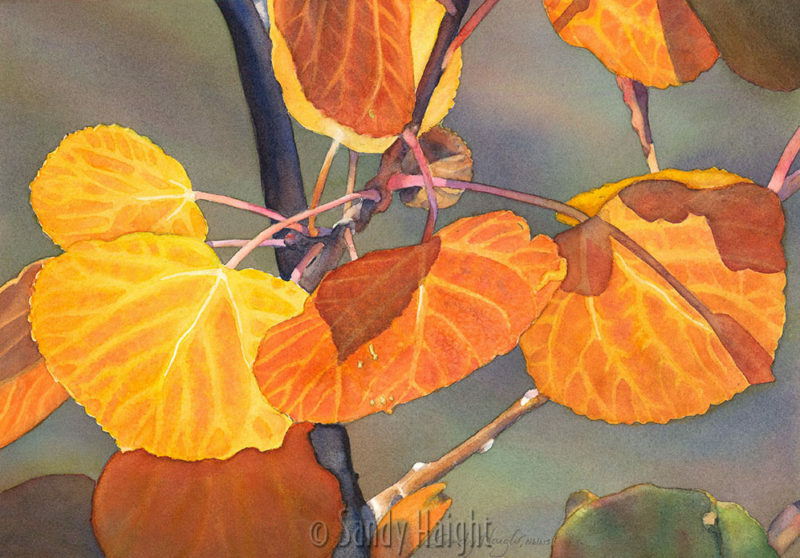 Watercolor by Sandy Haight. Image size 26″x40″. Frame size 30″x44″. In May of last year I camped and ventured extensively through the dramatic Southwest and experienced a raw, exposed landscape hostile to life, quite the opposite of the lush rain-kissed Northwest I call home. 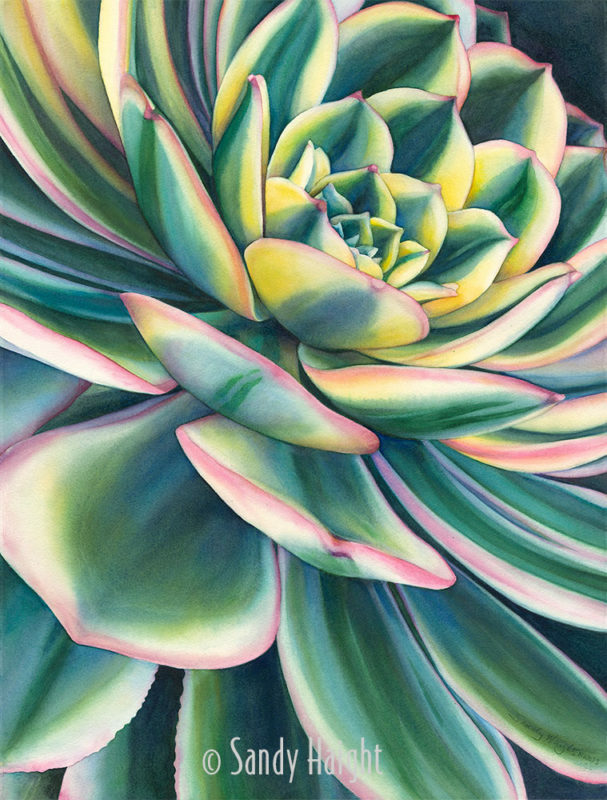 A new view of plant life in the dry world there compelled me to focus on succulents for my next series of paintings. The strong, tough petals and prickly thorns of desert plants have a dynamic sense of design with their own grace and beauty even as they may repel us from getting too close or be embraced softly like my other flower artwork. Also, my new island studio has now allowed me to explore larger sizes, and the challenges of scale so as to express my macro views of these plants and envelope the viewer ever more so in their commanding presence. Morning Beauty, above, and 2 other neutral colored agave works are extra large in size. The plants I chose to represent are not just huge Southwest agaves but include enlargements of small garden varieties of echeverias from coastal California and startling blooms from the Hindu Monestary gardens in Kauai, such as Flamenco Whorl seen below. All 8 new works are up-close and personal and all are big! 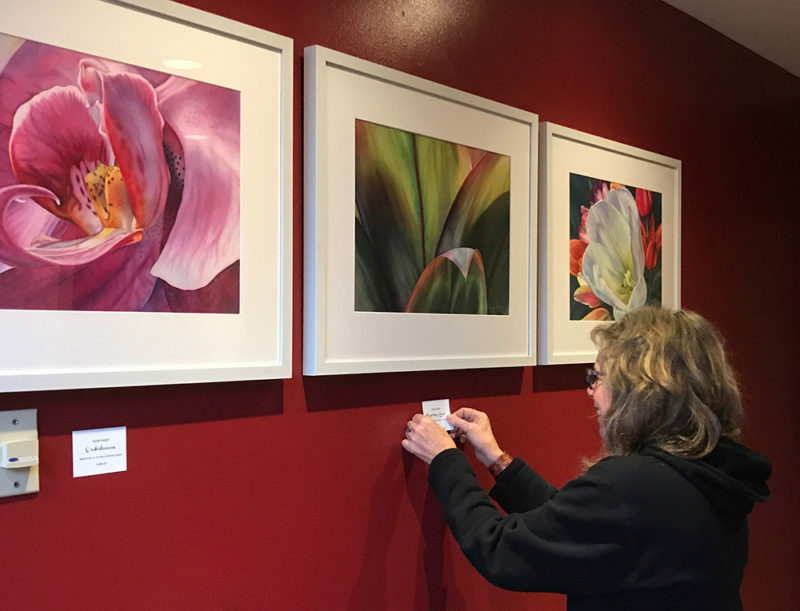 View them now by browsing the Floralscapes Gallery on my website or see information below for upcoming exhibits of them in November in Anacortes, WA and January on Bainbridge Island, WA! Enjoy! Flamenco Whorl. 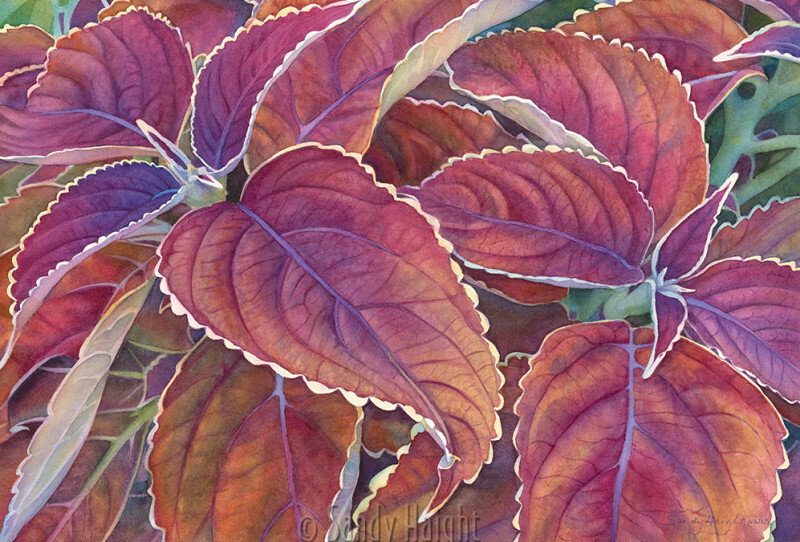 Watercolor by Sandy Haight. Image size: 30″x22″. Frame size: 30″x31″. I’m presenting these paintings for the first time this November at the Scott Milo Gallery in Anacortes, WA. 420 Commercial Ave, Anacortes, Washington 98221, in Old Town Anacortes. Gallery Art Walk Reception: Friday November 2, 6-9:00pm. I’ll be there! Come say hi! The next chance to see some of the Succulents in person will be closer to home at The Bainbridge Performing Arts Center lobby on Bainbridge Island in January 2019. A debut show for me after moving here last year! Art Walk Reception: First Friday, January 4, 2019. 5:00-7:00pm. I’ll be there! Come say hi! 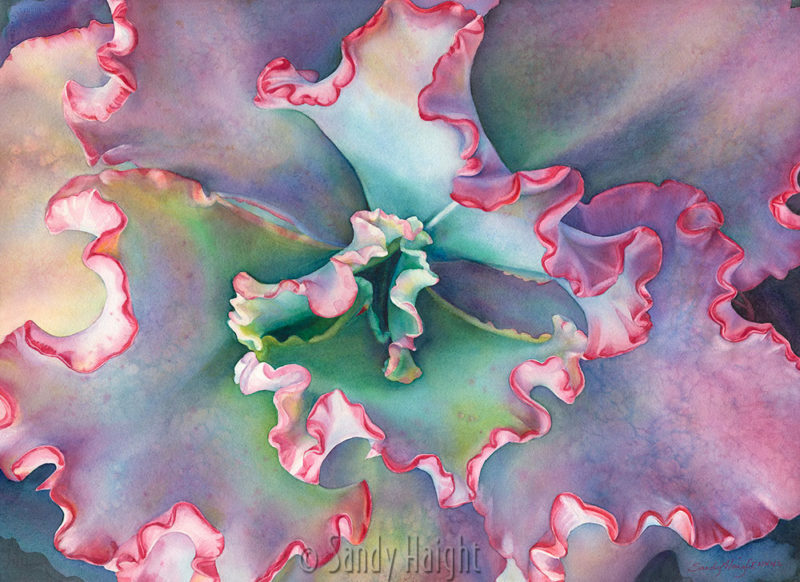 “Arboretum Star” by Sandy Haight. Framed watercolor: 28.5″ x 22.5″. Saturday September 1 at the Art Walk reception from 5:30-8pm. It’s a beautiful time of year to visit Port Townsend. The 42nd Annual Port Townsend Wooden Boat Festival starts September 7. 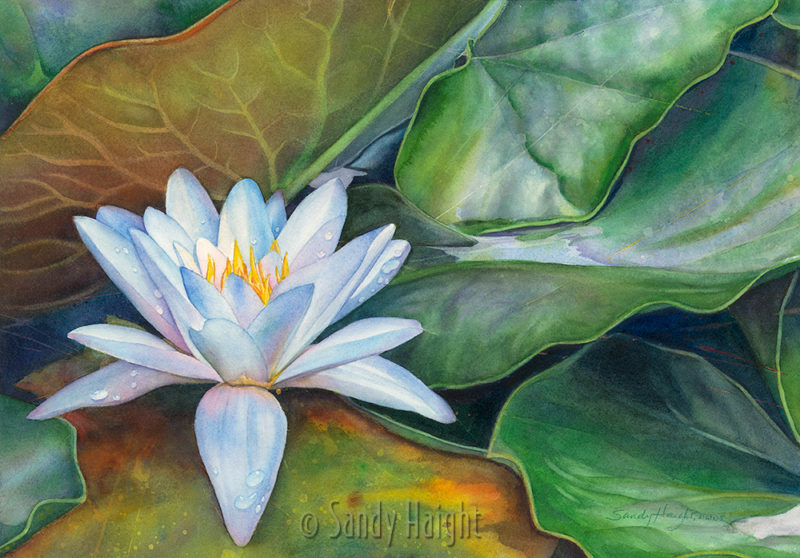 This lily will be floating along with the boats in spirit so stop by the gallery for a peek! Saturday October 6 from 5:30-8pm. “Frillery” by Sandy Haight. Framed Watercolor 28.5″ x 22.5″. 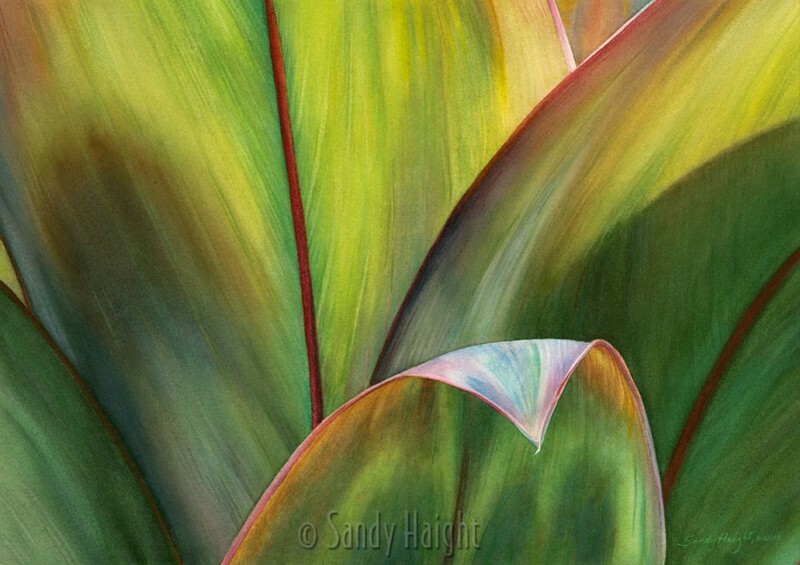 “Beguiling Kauai” by Sandy Haight. Framed Watercolor 27″ x 23″. 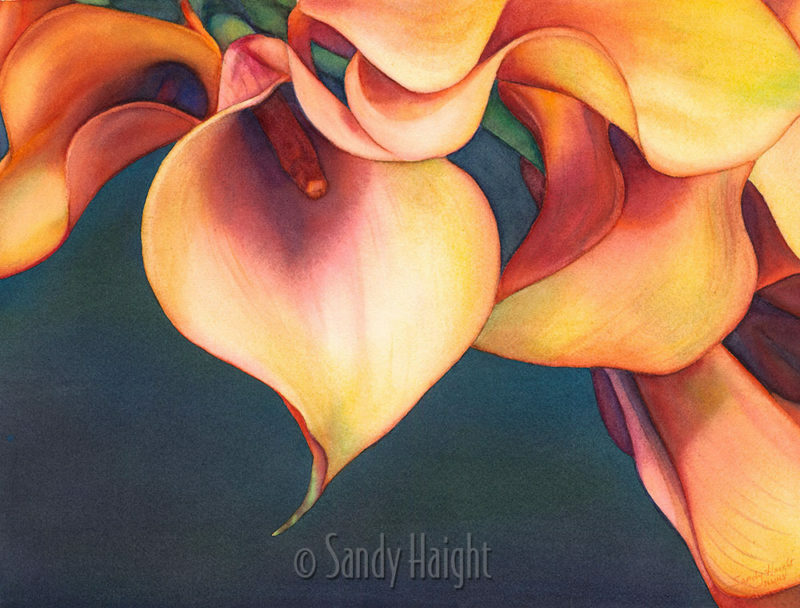 “Seduction of Lilies” by Sandy Haight. Framed Watercolor 27″ x 23″. Can’t you just feel seasonal the change in the air? Come and join me at the always lively reception on Saturday! Bring your friends or pass this along to someone who might be interested!